“It is so sad and unfortunate that a particular group of people, for political expediency and mischief, are trying to set the military and Nigerian society against each other. “It is sad, it is unfortunate,’’ Usman said while reacting to the face-off between the army and members of some groups in the zone, particularly in Abia. 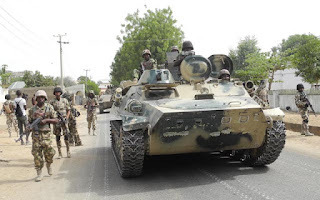 The army spokesman, however, maintained that in spite of the face-off, the army would go ahead to conduct its exercise, “Egwu Eke’’ – Python Dance II, due to commence on Friday. Usman described the face-off between the army and members of the Indigenous People of Biafra (IPOB) in Abia as an isolated issue which he said was being blown out of proportion by some people. “These isolated incidences, instigated by miscreants and mischief makers, therefore, should not be taken as something that should jeopardise the military exercise going on in that place . “It is really sad and unfortunate that people will not find time to ask question about the essence and activities involved in respect of exercise Egwu Eke II before jumping into conclusion. “The exercise is taking part in the entire South East and Cross River, why should we have problem in one state – Abia. The army spokesman called for understanding, saying that there “is need for all of us to be more responsible, exercise understanding about the issues at hand, support and encourage the military to perform its legitimate duty. “The exercise we are having has been scheduled since last year – 2016, it is not targeted at any segment of the Nigerian society. “As a matter of fact, it was because of the encouraging feedback that we have about the conduct of exercise Python Dance I in 2016 that brought the idea of having another exercise. “And being a responsible organisation, people said Python Dance seems to be something awkward, so, why don’t you call it in the native language of those people so that they can understand it just like you have exercise Harbin Kunama . “We have had exercises in other parts of the country. “As soon as we are done with exercise Egwu Eke II, we are embarking on exercise Crocodile Smile II which is also a scheduled training exercise in the circle of the Nigerian army training year, 2017. “And this time around, beyond the South South Zone, it will be extended to the South West zone, involving 2 Division, 6 Division and 81 Division,’’ Usman said. He argued that Egwu Eke was not an operation but a training exercise intended to sharpen the skills involved. On the reported attack by members of IPOB on other ethnic groups in Abia and part of Rivers, he said security agencies had risen to the challenge. “Well, there were reported attempts by hoodlums or miscreants to take undue advantage of what has been happening to harass and molest some other persons residing in the south east. “For instance, we have had incidents at Oyibo in Rivers and of course, Aba. Security agencies have risen to the challenge. “There are some mischievous elements that are peddling information to incite people. People should be wary about information on the social media,’’ Usman advised.